Grandstream UCM6100 PBX - Yet Another Aastra & snom Disaster? With this in mind, my first question to [Aastra's executive vice president] Yves Laliberte was "Aastra makes some very good IP phones that a lot of IP PBX vendors use but now you're moving into the IP-PBX space, so how do they feel about that?" Yves responded, "It's a great question. One that's delicate to answer. The reaction from our partners in the IP PBX space is that this changes the nature of how we are perceived. That being said this early in the game, time will tell soon how we both manage the evolution of that. Our goal and purpose is not so much to compete with our partners even though we have solutions that are targeting the same space. But from our perspective we are really trying to compete with the traditional PBX manufacturers that have various solutions for the small business. And we think we can use our critical mass and our approach and compete with them on price, easy of use, and support angle as well as further promote open source and open standards. I reached out to some well-known people in the Asterisk community and a Grandstream partner about the new Grandstream product. One had similar thoughts to mine and under condition of anonymity said, "Its sad to see a company who has built a great product in their phones with a loyal reseller channel of companies selling the phones bundled with their own PBXs to now compete with this very same channel. I know for one I will no longer be offering or pushing their phones to our users." He added, "A few years ago Aastra did this with their Aastralink 160 and they lost a lot of partners and since then have discontinued it. SNOM did the same thing with the SNOM One and received a large backlash and ended up selling off the SNOM One." 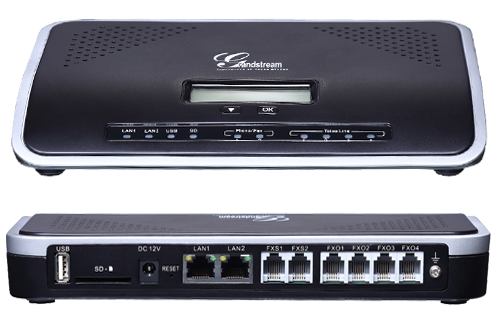 Now we come to a third phone manufacturer, Grandstream, attempting to offer an IP-PBX appliance. How will it fare when the AastraLink Pro 160 and the snom ONE have failed and left a sour taste in partners' mouths? The Grandstream product is very inexpensive when I checked it out. $495 for 2 FXS and 4 FXOports and only $899 for 2 FXS and 8 FXO port. They say "The UCM6100 offers a highly versatile, state-of-the-art Unified Communication (UC) solution for converged voice, video, data, fax and video surveillance application needs." Feature highlights include integrated 2/4/8/16 PSTN trunk FXO ports, 2 analog telephone FXS ports, and up to 50 SIP trunk options. It also has Gigabit network port with integrated PoE, USB, SD; integrated NAT router with advanced QoS support (UCM6102 only), and supports up to 60 concurrent calls and up to 32 conference attendees (on their high-end UCM6116 - $1799). They espouse this: "Automated discovery and Zero Configuration smart provisioning of various SIP endpoints (such as IP phones, IP cameras, etc. ), resellers, installers and SMB end users can quickly and easily install and operate this VoIP business phone system with little training." However, with many “turnkey” easy-to-use abtracted-out-complexity phone systems I've reviewed, you often lose some flexibility. It’s Asterisk-based, so I’m sure they abstract the core Asterisk out and put on their own user interface similar to FreePBX. However, I highly doubt it's as feature-rich as FreePBX, which has been in development for years and is used in 75% of Asterisk deployments. But to hear the truth of the matter, I reached out to Schmooze Communications CEO Tony Lewis, which is the company behind FreePBX to get his thoughts. It's great seeing manufactures adopt and accept Asterisk as a Telephony engine and each year Asterisk proves its a real player in the PBX space but it would be even better for consumers if they had a Freedom of Choice to add FreePBX GUI to the Grandstream Appliance and other Appliances out their. FreePBX has one of the most feature rich PBXs on Asterisk and allows easy development for Manufactures and OEMs to adopt. Tony makes a good point and makes me wonder - can't Grandstream just add their 'special' Grandstream features to the FreePBX GPL? Then if Grandstream feels that the FreePBX user interface is a bit too complex and want to hide certain features, they can do what Elastix did and put their own front-end on top of FreePBX. Elastix then offers the option to go “unembedded”, which gives you FULL access to all of FreePBX's user interface and features. Oh, and as long as Grandstream doesn't hide the cool free & paid FreePBX module add-ons! Then resellers, FreePBX/Schmooze, and Grandsteam UCM6100 users get the best of both worlds. Years of FreePBX development with powerful module add-ons, plus Grandstream's intellectual knowledge and features. I say leveraging the most popular PBX front-end and back-end PBX features from FreePBX makes the most sense. Why dedicate internal Grandstream developers to reinvent the wheel? This could be a huge mistake by Grandstream like it was for Aastra and snom, but only time will tell. Apple iPad - Your Next Desktop Phone? Grandstream UCM6100 PBX - Security & GPLv2 Disaster?